Following on from my previous post on the Death of the Chief Innovation Officer (and the forthcoming rise of the VP, Innovation! ), I’ve had several people now ask me about the rest of the contents of that presentation I gave on the “State of Innovation” – where is Innovation today? Back in 2001 when I first got involved with Innovation and Idea Management – we were most definitely selling to the Innovators out there. They behaved in typical Innovator fashion – looking for shiny objects, reading up research to get the latest and greatest in whatever business tools are out there, very little sensitivity to risk, and generally regarded as mavericks within their companies. What we’ve gone through in the last 7 years is the maturation of that market – and with that a change in not only who’s doing innovation, but also how they’re doing it, and what they’re looking for. It’s also signaled large scale changes in the market and how innovation is perceived and marketed by vendors. Let’s look at the most obvious indicator – the market landscape: In 2001, there were really only a few very small vendors out there – they were highly fragmented and tended to focus on niche elements of the innovation arena. I remember speaking to an industry analyst from Forrester at the time who told me that despite the fact that they loved our product “if you don’t have competitors, you don’t have a market”. We were missionary sellers to a market that didn’t know what we had or how to use it – and when they did use it, they tended to focus on using it to replace the old school system of paper based suggestion boxes and Excel spreadsheets. It was hard to find someone who could understand the potential in what vendors were trying to sell them – and even harder to find someone willing to look at committing the time, energy and resources into making it sustainable. Only serial entrepreneurs and mad men would dare enter the market at this point (and yes, we were both ;p ) . The market today is very different yet again – with a multitude of small vendors starting to flood the markets but ultimately the main market sticking to the few bigger vendors who serve defined markets but have multiple unique selling points to differentiate themselves as they try to find what the mass market that’s coming ahead really wants and needs. Financing is becoming easier because institutions are beginning to actually understand what is meant by the various terms that are used in the marketplace, and what the business proposition is. Enterprises as a whole are starting to understand – and nowadays, if they aren’t actively approaching the vendor market in some way, it doesn’t take them long to figure out how it can be useful to them. The market is rich with options – both from the software world and from the consulting world – big and small – local and global – there’s a vendor who can satisfy the market’s needs. Prices are high, but so are the rewards for sustainable innovators – and the current recession is only going to strengthen the innovation agenda (see my entry on this topic for more on recessions and innovation). 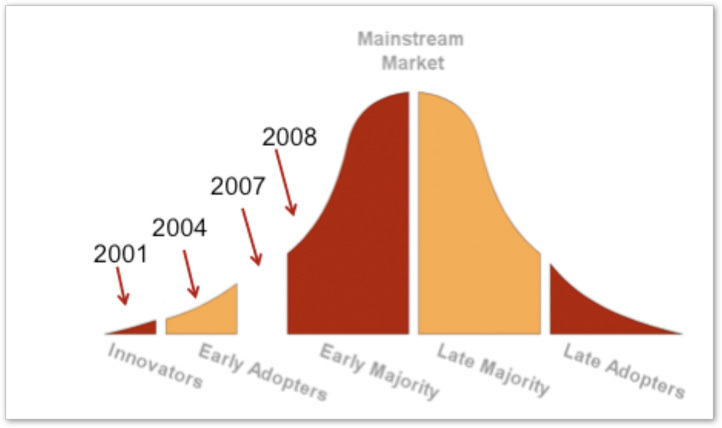 My personal feeling is that we’re about to begin tapping into the Early Majority stage of the adoption curve now having crossed the Innovator’s Chasm (the make or break point for any concept or product where you have to bridge the gap between the Early Adopters and the beginning of the mass market that is represented by the two majority groups) at the beginning of 2007.